Planning a family vacation can be costly… the accommodations, the entertainment, and the dining are all important factors for any well-rounded vacation budget. Don’t let a tight budget get you down, though, as there are plenty of affordable dining options that will help you not have to break the bank. Kick-start your morning on a high note with a delicious and affordable breakfast! Eggs Up is a local chain known for fast, friendly service and tasty eats that include a wide array of breakfast and lunch favorites. Guests can enjoy everything from pancakes, waffles, omelettes, and breakfast platters to sandwiches, salads, light entrees, and more. Eggs Up offers several locations throughout the Grand Strand. Related: If you are feeling a little lazy and want to enjoy breakfast to go or delivery, check out Bagel Factory. The menu includes bagels, breakfast sandwiches and plates, donuts, pancakes, French toast, and more. Call (843) 626-6445 for more information. Enjoy classic American diner fare in a classic 1950’s atmosphere at Burky’s Grill. The menu is simple and includes favorites like griddle grilled burgers, hot dogs, grilled chicken sandwiches, salads, and their famous Cincinnati style chili. Be sure to grab a scoop of Ashby’s Sterling Ice Cream for the kiddos! Prices here average only $6.50 / person for combos which include fries and a drink. Related: Do you need a place to grab a quick burger while exploring the beach? If so, pick up lunch at Peaches Corner. Conveniently located on the Myrtle Beach Boardwalk, Peaches has been an area staple for over 75 years and serves up fast beach fare on the fly at unbelievable prices. Conveniently located right off 10th Avenue North, between Highway 17 & Highway 17 Bypass, Simply Southern Smokehouse is a hotspot among locals – and for good reasons. The homemade entrees, sides, and desserts are made fresh throughout the day and guests can enjoy as much or as little as they like! Prices for the buffet are only $10.20 / dinner or $8.87 for lunch with discounts available for children. Related: Looking for BBQ to go? If so, pick up a family pack from Dickey’s BBQ. Options start at only $25 for a family of four, which includes a pound of barbecue meat and homemade sauce, 2 medium sides, and 4 rolls. Call (843) 839-0209 for more information. Craving a huge, juicy burger? If so, bring the clan to River City Café to indulge this appetite! Another local favorite, River City serves up more than 20 unique burgers that range from classic to crazy. Options include the California Pizza Burger, Palmetto Burger, Nacho Crunch Burger, and Peanut Butter Burger. Other dishes include hot dogs, chicken and shrimp baskets, appetizers, and more. Burgers average only $8 / person and come with crispy house fries. Children’s entrees are also available. Visitors looking to appease a Japanese craving without the cost of sitting at a full blown hibachi bar will love the affordable options at Jimmyz Hibachi. Lunch bowls average around $7/ person and dinner bowls clock in around $10 / person, with cheaper options available for the kiddos. Jimmyz also offers several starters, sushi rolls, and dessert and boasts FREE delivery. Now that’s a deal! 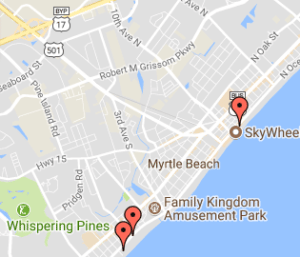 The two Myrtle Beach locations include Pine Island Drive and North Kings Highway. Johnny D’s is the perfect spot for the family who just can’t decide. The eclectic menu offers a wide array of breakfast and lunch fare to please even the pickiest palate. Options include signature omelettes, bagels and pastries, breakfast platters and skillets, wraps and sandwiches, pancakes, French toast, salads, burgers, and plenty of waffles – of course. Menu items average around $7 / person and are more affordable for children. Whether you are looking to pick up a quick lunch before hitting the beach or you want to take your fare to go for a picnic, head to the sandwich headquarters of Myrtle Beach – Dagwood’s Deli. This local shop serves up a variety of both classic and creative concoctions. All sandwiches are served with chips and a pickle and most are well under the $10 price point. Dagwood’s also offers a dedicated kids menu and delivery for a small fee. Our cheap eats list wouldn’t be complete without pizza! This family favorite is the signature dish at Ultimate California Pizza, a regional chain that enjoys several Grand Strand locations. A family of 4 could enjoy a large pie for about $20, a mere $5 / person when you break it down. There are plenty of pie options available in addition to several starters, sandwiches, and more. Related: If delivery pizza is more your style, check out Hungry Howie’s, another regional chain known for their creative crust flavors. Call (843)444-2000 for the location nearest our hotels. Lulu’s Café is a local favorite and an absolute “must” for hungry beach-goers. This funky spot recently underwent major renovations to provide a fresh, open atmosphere. The menu includes a variety of traditional and creative beach fare like loaded grilled cheese and PB&J sandwiches, generous burgers and fried baskets, breakfast plates, and the famous chicken and waffles. This Myrtle Beach landmark is hard to miss – just look for the building with the colorful mural on the wall facing north. Be sure to check the Myrtle Beach section of our website for even more affordable dining options.